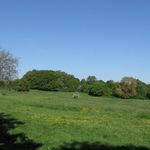 Hampstead Heath is one of London's largest pieces of parkland that runs between Hampstead and Highgate. Adjoing the grounds of Kenwood House, and with plenty of hills and an ancient woodland, the heath is a very picturesque location, perfect for summer and winter strolling. There is also a lido for public use, and wonderful views of Kenwood and Golders Hill Park. Do you work at Hampstead Heath? What did you think of Hampstead Heath?